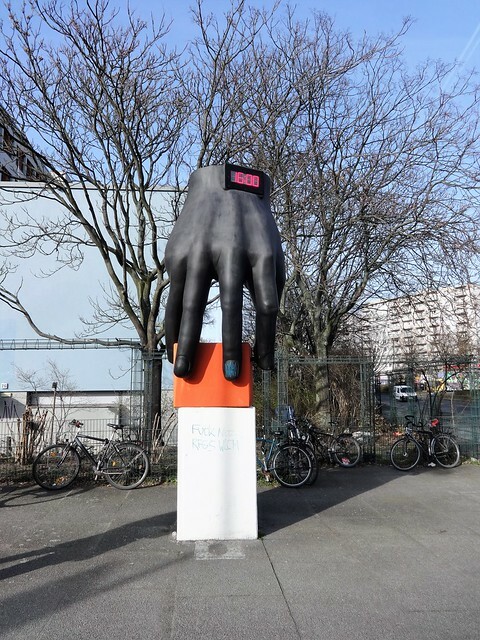 Found Twenty Nine (29) more giant hands have been added today (19/11/2018) in the Giant Hands Around The World Collection. A symbol of Armenian-Italian Friendship. It was a gift from the city of Carrara, Tuscany, Italy to Yerevan. Two giant golden hands, folded in the form of Namaste (A traditional way of Hindu greeting) located at a roundabout in Ahmedabad. The Peace Park is full statutes donated from around the world and each statue, conveys a message of friendship and peace to the city of Nagasaki, by donor cities/countries. 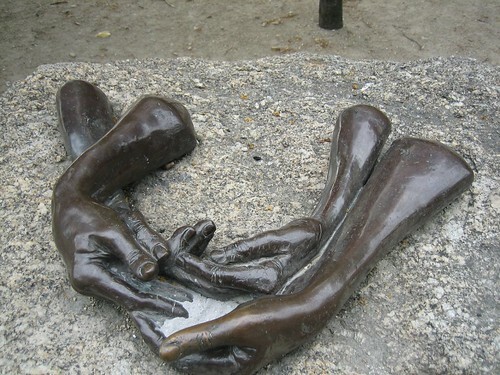 This sculpture which is a cut out of a male and female fingers holding their solid hands, is called "Infinity" and was donated by Ankara, Turkey. 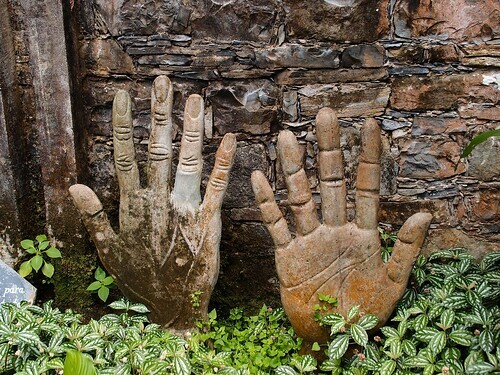 A pair of giant hands supported another pair of large hands holding a spade (?). The monument shows three gigantic hands holding hammer, sickle and calligraphy brush, symbolizing the workers, farmers and intellectuals. Designed by Mansudae Art Studio, it is 50 meters high to symbolize the 50-year anniversary of the founding of the Workers' Party of Korea. It was unveiled on 10 October 1995 to mark the 50th anniversary of the foundation of the party. 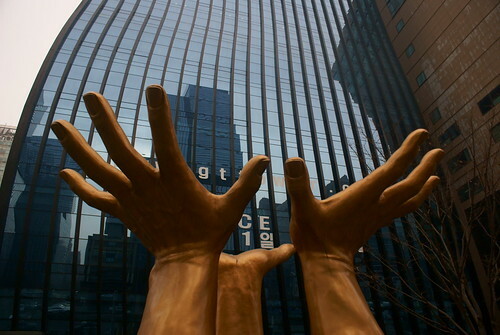 Three large, upraised hands in front of the GT Tower East. 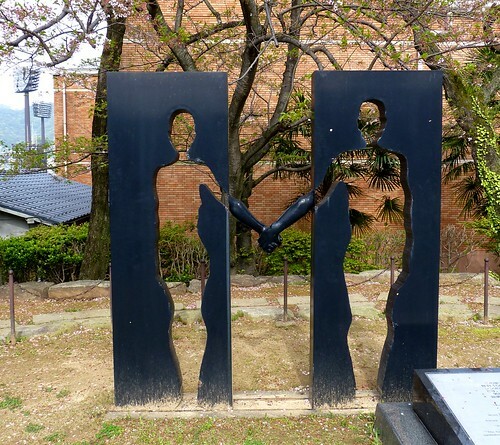 The artwork entitled "With Us" was created by Kim Moon Gyeong. 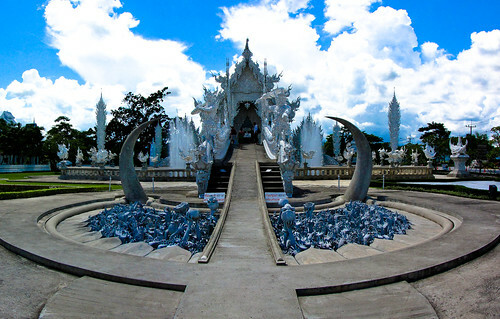 The contemporary Wat Rong Khun (aka White Temple), designed by local artist Chalermchai Kositpipat is full of symbolism based on the teachings of the Buddha. 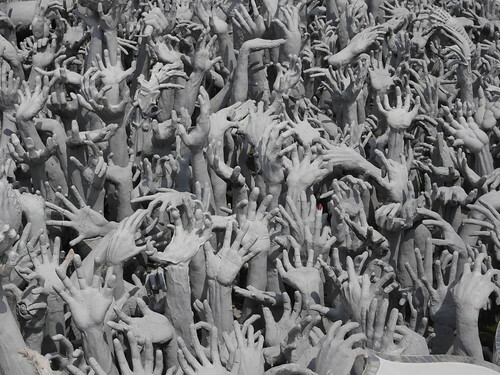 The main building of the temple is reached by a bridge over a small lake and hundreds of out stretched hands, emerge out of pits on both sides of passage way to the bridge. As per Wikipedia the hands "....symbolize unrestrained desire. The bridge proclaims that the way to happiness is by foregoing temptation, greed, and desire." Many roundabouts in Middle East/Saidi Arabia etc. have some sculpture to identify the roundabout. This roundabout in Fujairah, known as "Perfume Bottle Roundabout" is at the intersection of F20 with E89 and shows a giant hand holding a beautiful carved perfume bottle. Two giant hands holding a Globe with a dove on top of it. The Globe also depicts an oversized map of Vietnam in red. "Passation" an art work installed in front of the Palais des Beaux-Arts, Charleroi. Designed by sculptor, Martin Guyaux it shows three bizarre and spindly hands reaching out to sky. To the memory of those who gave, their life for others on January 4, 1979. And also in memory of all the deceased in work accident. This is a multi piece sculpture by French/American sculptor Louise Bourgeois. Located near the Jeu de Paume museum side, overlooking place de la Concorde, it consists of hands interacting with other hands on 6 granite pedestals, each has one or more bronze hands. 3 pedestals have 4 interacting hands each, 2 pedestals have 3 hands each and the 6th pedestal has solo (child's) hand. 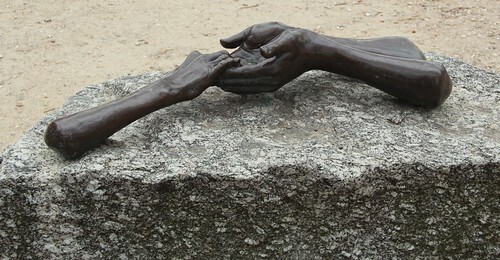 Hand mit Uhr (Hand With Watch) located at the intersection of Lessingstraße and Altonaer Straße in Berlin, is a sculpture by German sculptor Joachim Schmettau. Unveiled in 1975 it shows hand with watch, holding an orange cube. Due to weathering and graffiti vandalism it fell in disrepair and was removed in 2008. After renovation it was restored back in 2012. The hand originally had analog watch, which after renovation was replaced with a digital watch. 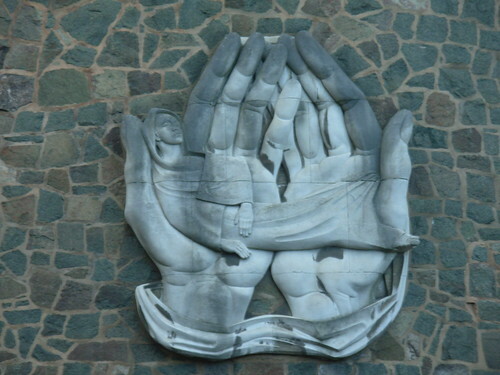 The sculpture titled "La voûte des mains" (The Vaulted Hands) is located on the German Federal Highway service area Waldkater, Helmstedt, Germany. 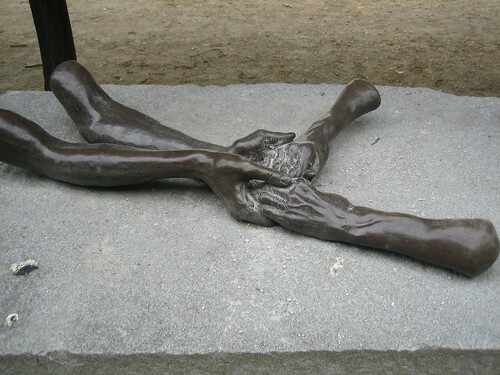 The interlocked hands symbolises the unity. 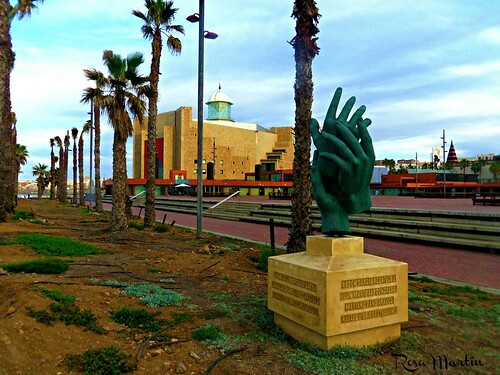 The 9 M high sculpture opened in 1995 was designed by the French artist José Castell. "Ludus" (meaning unknown?) 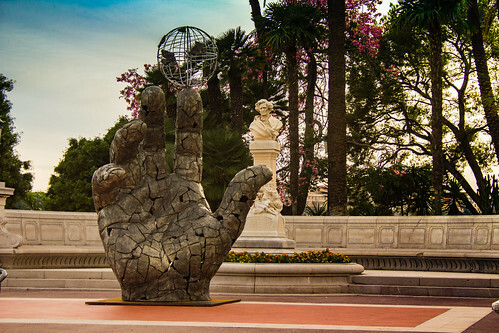 is an art work of of sculptor Bernard Bezzina unveiled near Casino Monte-Carlo in Sept. 2107. The sculptor had offered for the auction for the benefit of the Prince Albert II Foundation. It is not known if the sculptor is still there or has been taken away by the successful bider. It is visible in the Google Earth Imagery of April 2018. Looks like two persons about to shake hands. 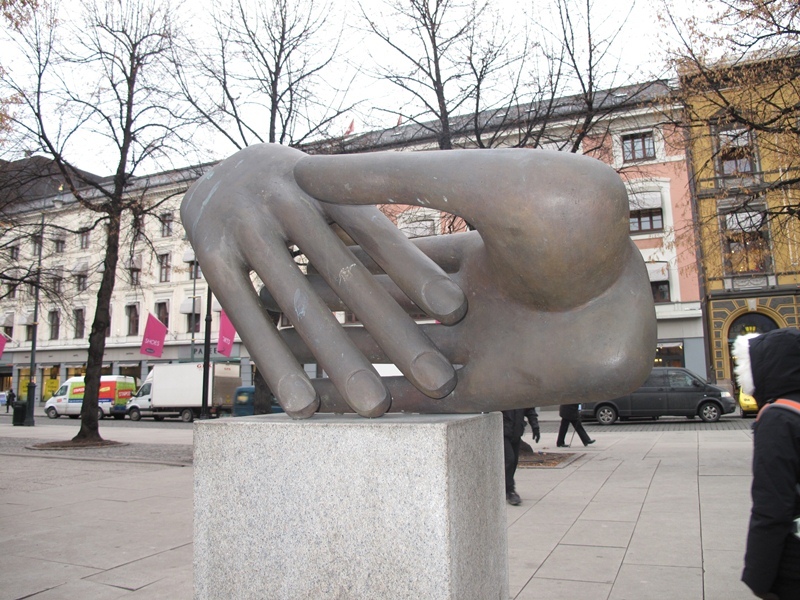 It is one of several sculptures located in the Fontana Center Park near the Norwegian Parliament, Oslo. A huge hand on the balcony of Collegium Nobilium building. The 18th century building was almost completely destroyed during the Warsaw Uprising. It was rebuilt after the war, together with its classic façade. It now houses the Aleksander Zelwerowicz National Academy of Dramatic Art. Large cut-outs of 4 hands entitled "Ладошки" (Ladoshki - probably meaning hands) in Park of 50 Anniversary of October, Moscow. The park was recently renovated and the original cut-outs were replaced with cut-out of different design. Cut-outs as visible till Sept. 2017. 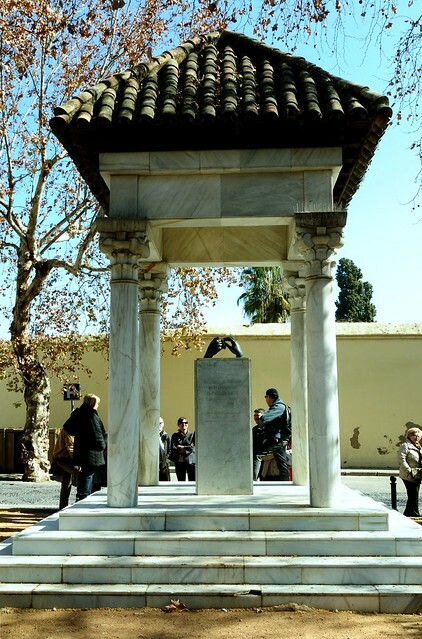 "Monumento a Los Enamorados" (Monument to The Lovers) is a monument in memory of the love story of 11th century Moorish princess poet Wallada, daughter of Caliph al-Mustakfi of Cordoba and poet Ibn Zaydún. 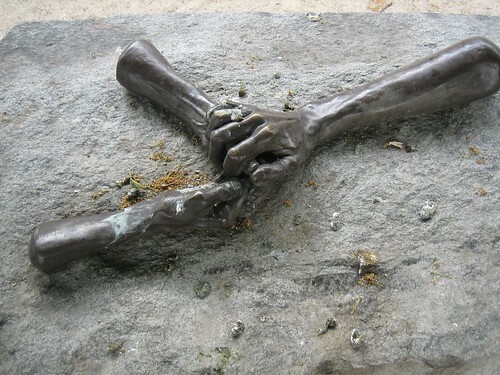 The monument depicts two touching hands mounted on a pedestal. Poems of Wallada and Ibn Zaydún, in Arabic with Spanish translation, are inscribed on the supporting pedestal. "Valencian Pilota" is a traditional handball game played in the Valencian Community and the ball is struck with a bare, or almost bare, hand. 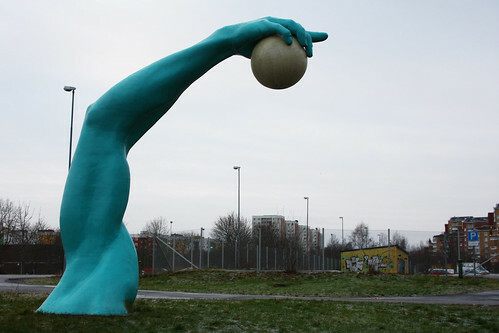 The sculpture shows two giant hands with one hand holding a ball. The sculpture is installed at "Vistas de Sant Josep" near the road leading to the Xativa Castle. 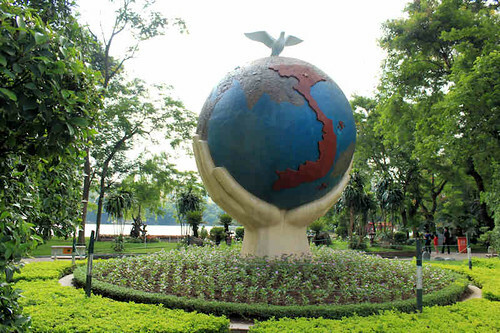 A land mark sculpture in the form of a giant hand holding a ball (snowball?) pointing towards Subtopia in Alby, a southern suburb of Stockholm, Sweden. 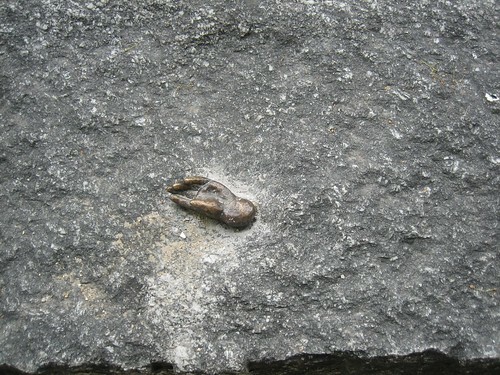 Located in Giessen 6, 8820 Wädenswil, Switzerland, no details are available about this hand. 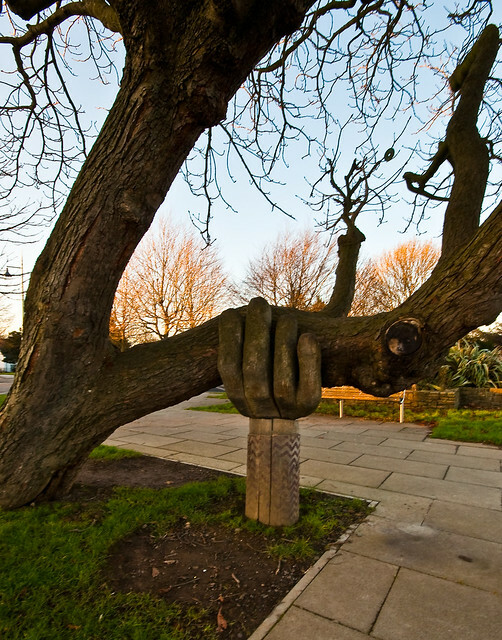 An innovative prop in the form of a hand, for supporting thick branch of a tree growing horizontally. Fixed on the wall of the Dept. of Genito-Urinary Medicine, Jarvis Building, Leicester Royal Infirmary, Leicester. The relief is made from 9 blocks of Portland stone and depicts a woman lying on two hands. Designed by Sculptor Albert Pountney, it was commissioned in 1954. The artwork is 2.45 m (8 ft) wide, 1.85 m (6 ft) high and about 0.35 m (1ft 2 inch) deep. Located in front of the entrance to the Walmsley Park. 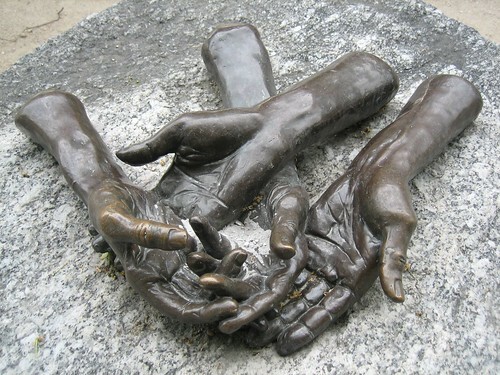 This hand with painted nails is one of the several sculptures, of varying forms and materials, which adorn the Art Park of the University. It is one of the few in this collection with painted nails. "The Hands" (Las Monos) on the rocks on the beach of Zicatela, Puerto Escondido. Las Pozas ("the Pools") a large garden created by Sir Edward James in a subtropical rainforest near the village of Xilitla, San Luis Potosí, more than 2,000 feet (610 m) above sea level. Sir Edward James was a British poet known for his patronage of the surrealist art movement and Las Pozas has natural waterfalls and pools interlaced with towering Surrealist sculptures in concrete. These two hands are reportedly modelled after the hands of Sir James. A pair of folded hands on the Shoresh David Messianic Synagogue of Tampa, Florida.